Roboteq intelligent controller capable of directly driving a brushed DC motor up to 120Amps at up to 50Volts. The LDC1450 is targeted at designers of Industrial Automation systems, mobile robots, automated guided vehicles, animatronics, or any other high power motor control application. The controller accepts commands from analog joystick, standard R/C radio, or RS232 interface, and can switch automatically from one mode to the other. The LDC1450 incorporates a Basic Language Interpreter capable of executing over 15,000 Basic instructions per second. This feature can be used to write powerful scripts for adding custom functions, or for developing automated systems without the need for an external PLC or microcomputer. The motor may be operated in open or closed loop speed or position modes with a 200 Hz update rate. 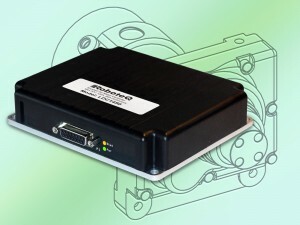 The LDC1450 includes an input for a Quadrature Encoder for precise speed and traveled distance measurement. The LDC1450 features intelligent current sensing that will automatically limit the power output in all load conditions. The controller also includes protection against overheat, stall, and short circuits. The controller includes up to 6 analog, 6 digital and 6 pulse inputs. Two 1A digital outputs are provided for activating, lights, valves, brakes or other accessories. The controller’s operation can be optimized using nearly 80 configurable parameters, such as programmable acceleration or deceleration, amps limits, operating voltage range, use of I/O, and more. A free PC utility is available for configuring, tuning, monitoring and exercising the motor. The controller can be reprogrammed in the field with the latest features by downloading new operating firmware from Roboteq’s web site. The LDC1450 is built into a compact 4.45”W x 5.50”L x 1.20″H (113mm x 140mm x 30mm) enclosed design. The controller’s conduction bottom plate that ensures sufficient heat dissipation for operation without a fan in most applications. The LDC1450 is available now to customers worldwide at $195 in single quantities, complete with all necessary cables and PC-based configuration software. Product information and software can be downloaded from the company’s web site at www.roboteq.com.